Last summer I went for lunch at my sister-in-law’s house and she served this. It was so delicious I’ve been making it ever since! This is the perfect addition to your summer BBQ menu as a vegetarian/vegan option. If you’re feeling creative you can switch up the salsa for mango salsa, strawberry salsa, or YOUR favourite salsa recipe. These are even better the next day as leftovers! Mmmm clean BBQ’ing never tasted so good! Enjoy! 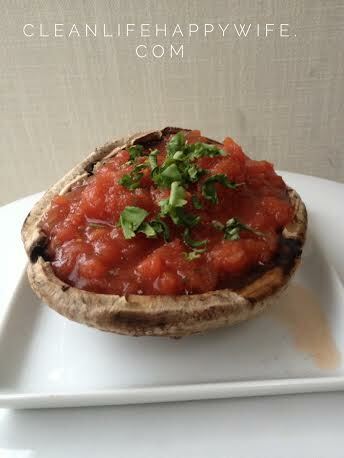 Stuffed portobello mushrooms are a perfect main meal! Love the idea of adding salsa. Yes! They are awesome as a vegetarian option at BBQ’s too! I have this for lunch at least once a week! I love them!